This script will add will add a completely new HUD system for Blizz-ABS. # the screen and increase lag. Requires Blizz-ABS to work. Not compatible with the SR display from CRLS (with CRLS-Blizz-ABS plugin), EOS and EXP in HUD plugin directly. For this HUD to work with them, they had to be edited in such a way to change the position of the bars that are being drawn. Here are template images that have been provided by other people. Make sure you credit them if you use them! Save them on your hard drive and extract them in the Graphics/Pictures folder. They will work with the default configuration without problems. nice, nice. I have plans to redesign the Dissipate one to look like an MMO HUD. But that won't be for a while. 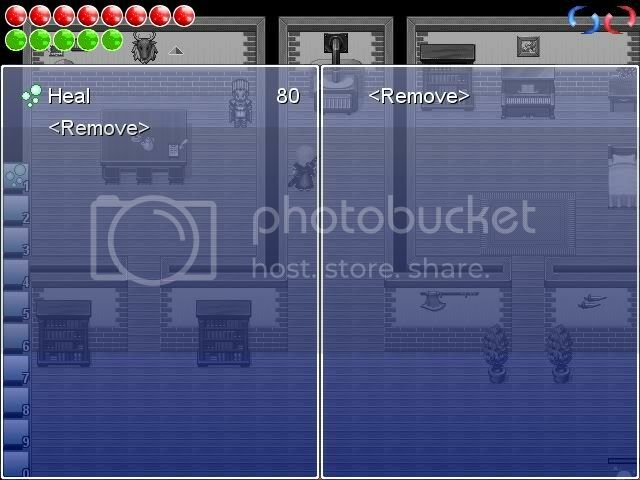 You should NOT use those images in your game! They are here for demonstration purposes only! I actually requested this script, this is how it looks in my own game. Blizz added a few extra feature I didn't even ask for, so thank him for those, it is such a wonderful script and works quite smoothly. It's up to you to make your game beautiful. Awesome Blizzard, Man u know everything about scripting that's neat! I might actually use this >.> now only to make custom images....Paint! I make graphic arts for HUD's for commissions, starting at 15$ for the first hour and 10$ every hour after. Professional looking work, just shoot me an email or PM and I'll get back to you, if you wish. would this be compatible with ur easy od system and with just regular bars for health and mp. and is there exp display? My custom bars are on the top of the screen Full length!!! Its a Great HUD, Its like plug n play!!! Wow, this is a really nice hud system. It works really well for what I had planned for changing my own game (I'm redoing a lot of the battle features). Just thought I'd share a screen shot of my hud. I love how you did the hotkeys! I'd show mine off but all I changed was the HP/SP and never changed the hotkeys/skills/items graphics. I stopped working on my game temporarily (I've gotten into Neverwinter Nights modding lately, my interests are all over the place! ).